For some months now, android device seems to be managing the blackberry messenger, that is android users are really celebrating the semi-burial of blackberry device. Recently, on the 28th of january, the blackberry carriers had realsed a new update, that is, they are now allocating a nice operating system (0S) updates. Wow, this sounds nice but for now seems like this update goes for only the BB10 users taking up a new version 10.2.1. This latest version of BB10 to 10.2.1 comes with cool features, acting more like a dual platform which is involving the amazing 0S updates, simply get yours updated easily and enjoy its latest features. How do i find androids apps and download on my BB10? Well its no big deal, we have so many third party websites where android apps for your BB10 device can be download. ==> After visiting any of the third party sites, then download any android (apk files) from it. ==> Install the apk file on your blackberry 10 device. The installation would start a ''processing'' indication which after you tap the install button on the top right, then accept which displays inform of pop-up window that informs you the permission for the app to be compatible for your device. ==>Congratulations!! 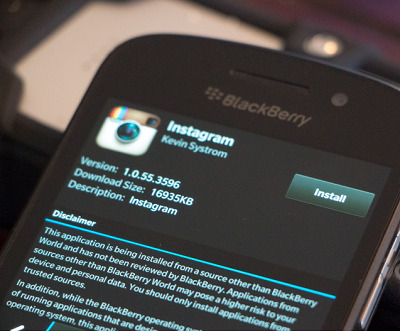 after installation, you can now run the apk file on your blackberry 10 device. It would be better if you sell out your bb curves, bb bolds, bb torch and any lower android device and go for the BB10 device because android apps now run on it, even instagram works with ease on it, and instead of battling on blackberry data usage on android, it would be adviceable to go get a BB10 device with longer battery usage. Then hw can we use BIS on our android phones?